eFolder is a leading supplier of cloud data protection, business continuity and cloud file sync solutions for businesses and IT service providers. The Cloudfinder platform delivers backup, search, and restore for broadly adopted business cloud applications, including Office 365, Salesforce, Google Apps, and Box. Businesses are largely adopting business-grade file sync and share to enhance productivity and collaboration in the workplace, while enabling employees to work anytime, anywhere, using any device. 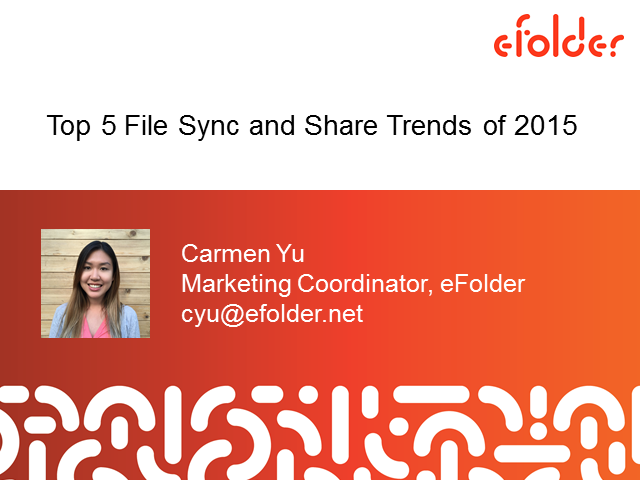 Join us as we take a look at some of the current trends in the business-grade file sync and share market. Find out what you should be looking for when considering a business-grade file sync and share solution for your organization. Organizations depend on SharePoint Online to host all their sensitive business documents and internal websites. Having a central file system enhances accessibility and collaboration, but if not properly backed up, organizations are at risk of losing sensitive business data. Join eFolder for this BrightTALK webinar to learn why it's important to safeguard your SharePoint Online data and how you can easily perform back ups and restores of your SharePoint Online data. Enterprise businesses are becoming more reliant on the Google Apps for Work productivity suite. Having all your important business applications like Gmail and Google Docs in one place makes collaboration easy, but the availability of cloud data is absolutely vital to your success. In this BrightTALK exclusive webinar, you'll learn why it's important to back up Google Apps for Work, and how to easily make back ups and restores of your organization's Google Apps for Work data. In this BrightTALK-exclusive webinar, you'll learn about the different factors to consider when deciding whether to use SharePoint or business-grade file sync to collaborate in the workplace. Data stored in Office 365 is business critical to most organizations. This is especially true of Office 365 Outlook Email, where the day-to-day success of a company depends on the availability of the data they send, receive, and store in the cloud. In this BrightTALK exclusive webinar, you'll learn how to back up and restore your organization's Office 365 Outlook Email in 10 minutes or less. Keep your email protected without having to spend all day worrying about it. With Salesforce data being one of an organization’s most valuable assets, frequent and consistent backups are imperative to safeguarding that resource. In this BrightTALK exclusive webinar, you’ll receive a step-by-step guide on leveraging Salesforce’s native Data Export service to backup Salesforce data. You'll also learn how to properly restore backed up files into Salesforce. Did you know that Google Apps for Work does not retain any data deleted from Google Drive? Or that Salesforce charges $10,000 for Data Recovery? Learn everything you need to know about the retention policies of Office 365, Google Apps, Salesforce, and Box in this on-demand webinar. With companies adopting SaaS applications more rapidly than ever before, the risk of cloud data loss has also risen. As many as 40% of companies that use cloud based applications have reported data loss since 2013, according to reports from the Aberdeen group and Symantec – but until cloud data disasters hit home, businesses tend not to prioritize cloud data backup. In this BrightTALK-exclusive webinar, you’ll learn about the biggest cloud data losses of the year, and how to make sure they don’t happen in your organization. Myth: Cloud data does not need to be backed up. Reality: A survey in 2013 revealed that 40% of businesses running cloud applications reported data loss. As a result, many companies are considering adopting cloud-to-cloud backup solutions – but how do you choose the right cloud-to-cloud backup solution? In this BrightTALK exclusive webinar, you’ll learn exactly what features to consider when evaluating a cloud-to-cloud backup solution.